SecureVideo - How do Account Services work? 1. Click on the profile icon in the upper right hand corner and select "Account Services" from the menu. 2. Scroll down to the bottom of the page and click the "Create Service" button. 3. Fill out the fields as appropriate. Service Name: Enter the name of the service as it should appear to participants. Service Description: Enter the description of the service as it should appear to participants. Scheduling Duration (minutes): Enter the number of minutes that should be blocked off for the service in your scheduling calendar. 4. 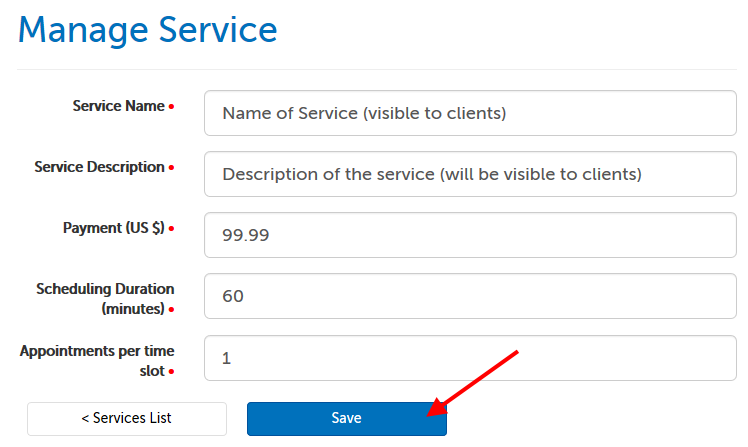 Click the "Save" button to create your service. This article was last reviewed by our Support team on July 31, 2017.